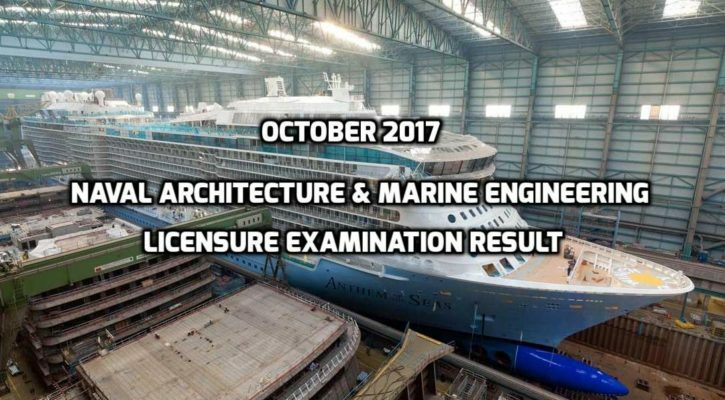 The results of the October 2017 Naval Architect and Marine Engineer Licensure Examination are now available from the recent announcement of the Professional Regulation Commission (PRC). After 3 working days of the final scheduled board exam, the commission revealed the list of successful passers. 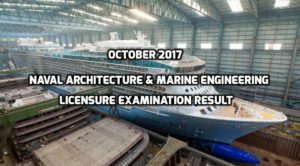 According to PRC, 117 took the examination last October 2, 2017 and only 51 passed the board. The Board of Naval Architecture and Marine Engineering of the PRC administered the exam held in Manila. Engr. Edward B. Cruz and Engr. William B. Hernandez took charge of the licensure (both are members of the board). The commission is reminding all the passers that the start of issuance of Professional IDs and Certificate of Recognitions begins on October 10 (Tuesday). It is important for the passers to visit the official website of PRC to check the guidelines and get more updates on when the oathtaking ceremony takes place.